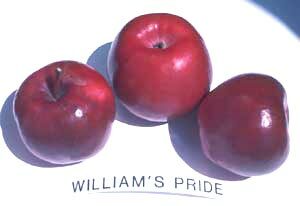 PRI (Universities of Purdue, Rutgers and Illinois Co-operative scab resistant breeding program) selection by E. B. Williams, West Lafayette, Indiana, USA. Patent by Flemings. Scab resistant, moderate resistance to fireblight and mildew. Medium to large, attractive, uniform, flat conical, long stalk in deep basin with slight russet sometimes; partly open eye in deep wide basin. Bright red to crimson (100%), slight stripe, smooth and shiny. Creamy flesh, red under the skin, crisp, medium grain, firm, juicy, sweet with slight tang and sub acid with moderate spicy flavour. Early March about Jonathan time, 7–8 days before Delicious. Fruit hangs well; moderately heavy cropper; annual bearer. 6 weeks; slight susceptibility to bitter pit and water core.